Do you like quizes? This event is for you! 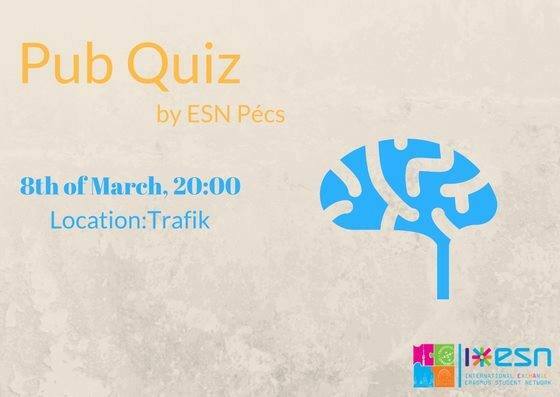 Here is the English pub quiz organized by ESN Pécs. Friendly competition, nice place and a lot of fun. Come and test your brain! Reservation: we are waiting for 10 teams, max. 6 members/team. Reserve a table: leave a post on the timeline of the event. Team name and number of the teammembers. Please note, that we cannot accept more, than 10 reservations. Even if you don't play, feel free to join us. The best team will win a prize! Entrance: Free entrance before 20:00, 300Ft after.